MACOMB, Ill. (AP) — Western Illinois University has awarded more master's degrees, on average, than any other school nationally. CHICAGO (AP) — University of Illinois at Urbana-Champaign researchers and Chicago-area scientists are working to create a communications network that can withstand hacking. BOISE, Idaho (AP) — Leon Lederman, an experimental physicist who won a Nobel Prize in physics for his work on subatomic particles and coined the phrase "God particle," died Wednesday at 96. He's described as a giant in his field who also had a passion for sharing science, resulting in his book, "The God Particle." NEW YORK (AP) — Scientists from the United States, Canada and France won the Nobel Prize in physics Tuesday for revolutionizing the use of lasers in research, finding ways to make them deliver more powerful flashes of light and even to act like tiny tweezers. Their work paved the way for laser eye surgery to improve vision and studies that can manipulate cells and their innards. Scientist Arthur Ashkin thought he might have a chance to win a Nobel Prize a few decades ago. But the 96-year-old from Rumson, New Jersey, said he had "given up worrying" about such things a long time ago. That changed early Tuesday when Ashkin learned that he and two others had won the Nobel Prize in physics for their work with lasers. GENEVA (AP) — Officials at the world's largest particle accelerator on Monday suspended an Italian physicist pending an investigation into his "highly offensive" presentation on gender issues that raised new concerns about sexism in science. CERN, the European Organization for Nuclear Research, said Alessandro Strumia of the University of Pisa was out of line in his talk Friday for a seminar on "High Energy Theory and Gender." YORKTOWN HEIGHTS, N.Y. (AP) — A race by U.S. tech companies to build a new generation of powerful "quantum computers" could get a $1.3 billion boost from Congress, fueled in part by lawmakers' fear of growing competition from China. LONDON (AP) — One of Britain's leading astrophysicists is donating her $3 million purse from a major science prize to encourage diversity in physics. EAST LANSING, Mich. (AP) — It would be a signature that's virtually impossible to fake. Because you'd need an immensely powerful nuclear science research facility to create it. A pair of Michigan State University researchers — Wolfgang Bauer and Bradley Sherill — have proposed using equipment at the university's $765 million Facility for Rare Isotope Beams to embed isotopes below the surface of valuable works of art. MEXICO CITY (AP) — Mexico's National Autonomous University says it has admitted a 12-year-old student to its undergraduate degree program in biomedical physics. The university, better known by its Spanish initials as the UNAM, said Thursday that Carlos Santamaria Diaz is the youngest such student in the university's roughly century-long history. Santamaria Diaz passed the entrance exam and has already done preparatory study at the university's school of chemistry in its genetics sciences center. NEWPORT NEWS, Va. (AP) — Enter what looks like an industrial garage on the Thomas Jefferson National Accelerator Facility campus, make your way about 25 feet underground and you'll find yourself standing in the midst of scientific history. NEW YORK (AP) — Weeks after his death, physicist Stephen Hawking has delivered his last thoughts about the nature of the cosmos, and he says it may be simpler than often believed. Well, simpler if you understand theoretical physics, anyway. It remains incomprehensible for the rest of us. DURHAM, N.H. (AP) — The first woman to earn an advanced degree in physics from the University of New Hampshire will be among those recognized at the school's commencement ceremony next month. CLEVELAND, Ohio – When Leonardo da Vinci sketched water falling into a pool or flowing past an obstacle, he bridged science and art to reveal the beauty and wonder of physical forces that govern the universe. Tauba Auerbach, the 36-year-old New York artist whose work is the focus of a challenging, austere and subtly beautiful exhibition at the Museum of Contemporary Art Cleveland, is a breaking the da Vinci code, in her own new way. STARKVILLE, Miss. (AP) — A Mississippi State University senior will receive a Barry Goldwater Scholarship. The university says physics major Nicholas A. Ezzell of Laurel will be the only Mississippian to get the award this year. Ezell has conducted research at the U.S. Department of Energy's Oak Ridge National Laboratory and will return there this summer to develop quantum computing software. He hopes to attend graduate school and ultimately work as a computational physicist. NEW ORLEANS (AP) — The University of New Orleans says an endowment has been set up to honor longtime physics professor George Ioup who died in 2016. The university says the endowment is funded by a gift from Ioup's wife, Juliette who is also a UNO physics professor. The $50,000 endowment will provide awards of $1,000 to one undergraduate and one graduate student each year. CAPE CANAVERAL, Fla. – NASA is expanding its search for other planets that can support life. NASA’s Transiting Exoplanet Survey Satellite (TESS) is in final preparations for its scheduled April 16 launch to find undiscovered worlds around nearby stars, providing targets where future studies will assess their capacity to harbor life. Played Division II football. Played Arena League football (Iowa Barnstormers, Orlando Predators, Fargo Freeze, if you were curious). Degrees in physics and mathematics. Coaching stops all over the map, at every level of the game. Turned down a job at NASA to coach football. Yes, that NASA. We still haven't gotten to the part about how he learned to speak fluent French before he was old enough to drive a car. HUNTINGTON — Howard Richards of Marshall University's Department of Physics has developed a model for the NCAA men's basketball tournament using nontraditional methods of physics. Richards, an assistant professor of physics, said the model is extremely simple and can be implemented using a Microsoft Excel spreadsheet. "His passing has left an intellectual vacuum in his wake. But it's not empty. Think of it as a kind of vacuum energy permeating the fabric of spacetime that defies measure." — Neil deGrasse Tyson, director of New York's Hayden Planetarium, on Twitter . LONDON (AP) — Stephen Hawking, whose brilliant mind ranged across time and space though his body was paralyzed by disease, died Wednesday. He was 76. Hawking died at his home in Cambridge, England, according to a statement by the University of Cambridge. PARIS (AP) — In his final years, the only thing connecting the brilliant physicist to the outside world was a couple of inches of frayed nerve in his cheek. 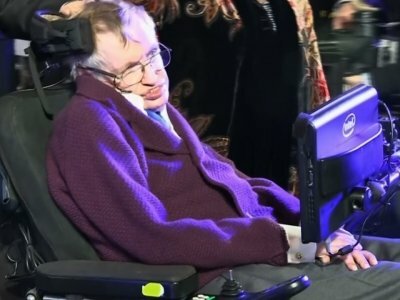 As slowly as a word per minute, Stephen Hawking used the twitching of the muscle under his right eye to grind out his thoughts on a custom-built computer, painstakingly outlining his vision of time, the universe, and humanity's place within it. LONDON (AP) — Key events in the life of celebrated physicist Stephen Hawking, who died Wednesday at 76. Jan. 8, 1942 — Born in Oxford, England, the eldest of four children of Frank Hawking, a biologist, and Isobel Hawking, a medical research secretary. 1952 — Attends St. Albans School. 1959 — Receives a scholarship to attend University College, Oxford, from which he graduates with a degree in natural science. 1962 — Begins graduate research in cosmology at Cambridge University. CAMBRIDGE, United Kingdom — Famed British theoretical physicist Stephen Hawking has died at his home at the age of 76, according to numerous reports. POCATELLO – The Idaho State University Physics Program will host Pi Day Physics at Pine Ridge Mall in Chubbuck on Wednesday, March 14, from 5 to 7 p.m. for interactive science challenges and demonstrations and a chance for participants to eat a free slice of pie. Kids ages 5-16 will be awarded a slice of pie, donated by Albertsons and Fred Meyer, if they can successfully complete a science challenge. There will be different science challenges for different age groups. Who’s the fairest of them all? Physics. CLEVELAND, Ohio - Case Western Reserve University restricted star physicist Lawrence Krauss's access to campus in 2009 because of a sexual harassment complaint, according to a report in BuzzFeed News. Chronic beryllium disease, which can be caused by exposure to the the element beryllium, was the cause of death in 1988 of pioneer physicist Herbert Lawrence Anderson, who helped develop the atomic bomb at Los Alamos, according to a New York Times obituary from that year. The Los Alamos National Laboratory’s handling of its beryllium supply is faulted in a just-released U.S. Energy Department report from the Office of the Inspector General. DeKALB – Why is a hockey puck black and frozen before the game? How does the angle of a hockey stick affect lift? How does the design of an ice skate affect a player’s performance? These are some of the questions to be addressed during Northern Illinois University’s STEM Cafe discussion Thursday, which will seek to illustrate basic physics concepts using the sport of hockey. SANTIAGO, Chile (AP) — Nicanor Parra, a Chilean physicist, mathematician and self-described "anti-poet" whose eccentric writings won him a leading place in Latin American literature, died Tuesday. He was 103. His death was confirmed by Chilean President Michelle Bachelet, who expressed her condolences. Her government ordered national flags to be flown at half-staff in public buildings and decreed two days of mourning. The Winona State University Retiree Center’s Senior University program will host “Great Ideas in Physics” from 3:30 to 5 p.m. Wednesdays, Jan. 24 through Feb. 14, in Pasteur Hall, room 133, on the university’s main campus. J: So you're in college now? J: Where do you go to school? J: What are you studying? A: I'm still deciding, probably grad school. J: And do you know what you want to do after that? A: I'm interested in condensed matter and applied physics. I still have some time to think about the details. OWINGS MILLS, Md. (AP) — Though he's pretty adept at flinging the football, Sam Koch is far more valuable to the Baltimore Ravens when using his right foot. Koch leads the NFL with 37 punts inside the 20 yard-line, including 16 inside the 10. He received a game ball last Sunday — a rarity for a punter — after he pinned Cleveland inside the 20 on four of his five kicks, three of which were downed within 5 yards of the goal line. LEAD — Lead loves neutrinos, so when Nobel Day featured speaker Dr. John Wilkerson stated, “The future is bright for neutrino physics,” it was music to the audience’s ears. More than 40 people showed up to Nobel Day Thursday at the Sanford Lab Homestake Visitor Center to join Wilkerson in celebrating the elusive particle’s place in the universe. There's nothing saucy about flying tomatoes on North Augusta High School's band practice field. Students in Kathy Gambill's AP Physics class at North Augusta spent a chilly Monday morning launching tomatoes across the field for a test grade, but also for fun. For about 16 years, Gambill said, her AP Physics students have been making machines to apply principles they learn in class. Astrophysicists at Los Alamos National Laboratory were enjoying a typical Friday evening with friends and family on Aug. 25, 2017, when they began hearing excited chatter about a major new astronomical observation pouring in over the phone and social media. Breaking news doesn’t happen that often in astronomy, and this was big. LIGO, the Laser Interferometer Gravitational-wave Observatory, had detected another gravitational-wave signal, just the fifth announced by the LIGO team since the observatory began operating two years ago. BERLIN (AP) — German automaker Volkswagen and Google have announced plans to cooperate in exploring possible uses in the auto industry for quantum computers. Volkswagen said Tuesday that specialists from the two companies will work together using Google quantum computers, jointly developing algorithms and simulations.